^ Died on 03 August 1894: George Innes I, US Hudson River School painter, specialized in Landscapes, born on 01 May 1825.  George Inness, born near Newburgh, New York, was the fifth of thirteen children. His father, a prosperous grocer, tried to make a grocer out of him, but the youth decided instead to become an artist. About 1841, he received a month's instruction from John Jesse Barker, a painter living in Newark, New Jersey, where the Inness family had moved in 1829. From the age of sixteen, Inness served a two-year apprenticeship as an engraver with the New York mapmaking firm of Sherman and Smith. He took some instruction in painting from R�gis Gignoux [1816-1882] about 1843, around the time he was studying and being influenced by prints of the paintings of Claude Lorrain and the seventeenth-century Dutch landscape masters. He was also seeing the work of the leading Hudson River School painters - particularly that of Thomas Cole and Asher B. Durand - whose style is recalled in some of his early canvases. Inness exhibited for the first time at the National Academy of Design in 1844 and continued to exhibit there almost every year until the end of his life. Though he was elected an Associate of the Academy in 1853, he was not made an Academician until 1868. He was one of the important early members of the Society of American Artists, an exhibition organization founded in 1877 to challenge the conservative policies of the Academy. By the late 1840s, Inness was exhibiting regularly in New York and had attracted a patron, Ogden Haggerty. Inness married Elizabeth Hart in 1850, and the following February the couple departed for a fifteen-month stay in Italy made possible by Haggerry's financial support. On their way home, they stopped in Paris, where Inness visited an exhibition that included work by the Barbizon painter Th�odore Rousseau; after a second trip abroad, in 1853-54, the work of Rousseau and other Barbizon painters exerted a strong influence on Inness's art. Inness and his family left New York in 1860, moving first to Medfield, Massachusetts, and later to an estate near Perth Amboy, New Jersey. In the early 1860s, fellow artist William Page introduced Inness to the theories of Emanuel Swedenborg, which made a deep and lasting impression on him; indeed, became a major force in his intellectual life. Throughout that decade, spent in rural surroundings, he sought to make his paintings convey the profound spiritual meaning he felt the landscape around him possessed. In 1870, the Innesses moved to Italy for four years, during which time the artist sent back paintings to be sold by the Boston dealers Williams and Everett, receiving in exchange regular monthly payments. Stopping again in Paris on the way back to the United States, in 1874, Inness first saw works by the Impressionists in an exhibition he visited, but he thought little of that new style of painting. In 1878, Inness's fortunes improved when Thomas B. Clarke, a prominent New York art dealer, became his agent. He took a studio in the New York University Building and bought a house and studio in Montclair, New Jersey. His theories on painting were published in Harper's New Monthly Magazine in 1878 and 1882; in 1882, Charles De Kay, under the pseudonym Henry Eckford, wrote an important critical article about his work. Two years later, a major exhibition of Inness's work was sponsored by John E Sutton, proprietor of the American Art Association, from which the artist emerged as the leading light in American landscape painting, an eminent position he enjoyed for the rest of his career. During the last years of his life, he spent summers traveling and painting in Connecticut, New York, Massachusetts, Virginia, California, and Florida. He and his wife returned to Europe in 1894, when Inness once again visited Paris, as well as Baden-Baden and Munich. On his way home, he died of a stroke in the Bridge of Allan, a small Scottish resort village. On 23 August 1894, the National Academy of Design held an impressive funeral service for Inness, who was by then one of its most illustrious members. — George Inness, one of the most prominent figures in US art of the 19th century, is best-known today for his poetic and highly expressive approach to landscape painting. He was born in Newburgh, New York, in 1825, the son of a local grocer. While still a youth, he decided to pursue a career as an artist. He initiated his studies during the 1840s, working briefly under John Jesse Barker in Newark, New Jersey. At some point between 1843 and 1845 he was taught by the French-born landscapist, Regis Gignoux, in New York City. During this period, he also spent two years as an apprentice engraver with the New York firm of Sherman and Smith. Inness began exhibiting his pictures at the National Academy of Design in 1844. His early work, in its emphasis on detail and topographical accuracy, reveals the influence of the prevailing Hudson River School aesthetic as exemplified by such painters as Asher B. Durand. However after making trips to Italy (1851-1852) and France (1853-1854), he became deeply influenced by the serene, broadly-painted landscapes of Rousseau, Troyen, Daubigny and other members of the French Barbizon School. In 1860, for reasons of health as well as discouragement with what he felt to be a lack of recognition from local critics and patrons, Inness moved with his family to Medfield, Massachusetts. He remained there for four years and then settled at Eagleswood, an estate near Perth Amboy, New Jersey. It was around this time that he met the painter William Page, who introduced him to the spiritual teachings of the Swedish philosopher Emanuel Swedenborg. Throughout the 1860s, Inness gradually began to abandon many of the precepts associated with the Hudson River style, turning instead to a greater emphasis on mood and poetic effect through the use of rich color and fluid brushwork. One of his major points of divergence involved his vision or concept of the US landscape itself; while the Hudson River painters focused on the untamed wilderness, Inness was drawn to what he once described as the "civilized landscape," where nature was shaped to suit the needs of mankind, a combination of both the real and the ideal. In 1870, Inness made another trip to Europe, spending most of his time in Rome. Returning to the United States four years later, he spent a year in Boston before moving back to New York in 1875. In 1878, he bought a home and studio in Montclair, New Jersey, where he would live for the rest of his life. During that same year, he helped to found the Society of American Artists, a group of younger, European influenced artists dissatisfied with the conservative, insular attitude prevailing at the National Academy. In 1882, Inness's work was the subject of a major article by the New York critic Charles De Kay in Century Magazine. Two years later, a comprehensive exhibition of his pictures at the American Art Galleries helped further to strengthen his growing reputation. Throughout the 1870s and 1880s, Inness's art moved towards a greater level of individual expression. He continued to explore various aspects of both style and theory, always turning to color for its emotive potential. He also began to incorporate one, sometimes, two figures into his compositions, evident in such works as The Monk (1873). Inness produced his most original and his most visionary work during the last decade of his life. In paintings such as Sunrise, he explored mood and feeling through color, diffused light and a limited number of softly defined forms. Many of his pictures from this period are depictions of forest interiors at dawn or twilight. Although the hazy atmospheric qualities and ethereal nature of Inness's late work has led to comparisons with Impressionism (a movement which did inform his work to some extent), his concept of nature--spiritual, subjective (and thus very modern) — took him well beyond Impressionism's material and scientific concerns. Indeed, in his emphasis on emotion, his free handling of pigment and in his quiet, harmonious compositions, he was tremendously influential for a younger generation of painters, such as Henry Ward Ranger and Dwight Tryon, whose related aesthetic concerns have since been defined as Tonalism. During his later years, Inness painted in New York, New Jersey and Connecticut as well as in California and Florida. He traveled to Europe in 1894, visiting Paris, Munich, and Baden. He died in Bridge-of-Allan in Scotland that same year. — Louis Comfort Tiffany [1848-1933] was a student of Inness. ^ >Died on 03 August 1816: François~André Vincent, French Neoclassical painter, specialized in historical subjects, born on 30 December 1746. — Vincent, son of the Genevan miniaturist Fran�ois Elie Vincent, and student of Joseph-Marie Vien, was one of the principal innovators in French art of the late l8th century, particularly in the fields of neoclassicism and themes of national history. He won the Prix de Rome in 1768 and in the 1770s he fell under the strong influence of Fragonard, whom he met in Rome in 1774. From the 1780s onwards, his studio ranked with those of David [30 Aug 1748 – 29 Dec 1825] and of Jean-Baptiste Regnault [17 Oct 1754 – 12 Nov 1829] as the most popular in Paris. Unlike his archrival David, also a student of Vien, Vincent rejected frieze-like compositions for a more realistic approach to his subjects that drew inspiration from a wide variety of sources, ranging from Netherlandish to Bolognese art. Nevertheless David eventually overshadowed Vincent, who then abandoned the monumental history paintings which David had made his own, and turned increasingly to genre painting. — Vincent's students included Horace Vernet and John Vanderlyn. — Vincent became the lover of Ad�la�de Labille-Guiard [1749-1803], whose first teacher had been his father. In 1800 he married her, becoming her second husband, and she painted .his portrait (1800, 73x59cm; 882x809pix, 64kb — .ZOOM to 2247x2024pix, 380kb). �- La Leçon de Labourage (an VI = 1798, 213x313cm; 741x1128pix, 73kb — .ZOOM to 1769x2819pix, 410kb) _ The upper part of the canvas was burnt in a fire on 07 December 1870. There are two preparatory drawings; three studies in paint also exist. The scene attests to the physiocratic ideas as found in Treatise on the Cultivation of the Land (1750) by the agronomist Henri Louis Duhamel du Monceau [20 Jul 1700 bapt - 22 Aug 1782] and Rural Philosophy or General and Individual Economy of Agriculture (1764, 3 volumes) by the economist Mirabeau [1715-1789]. It may depict the family of the future Girondin member of the National Convention, Fran�ois Bernard Boyer-Fonfr�de [1766-1793], with his wife Marie-Anne, n�e Barr�re, and their children Genevi�ve and Jean-Fran�ois Bernard, who is having a ploughing lesson. — Henri IV faisant entrer des vivres dans Paris (1783, 157x192cm; 611x768pix, 57kb) _ Assi�geant Paris en 1590, Henri IV d�cide, contre l'avis de ses g�n�raux, de ravitailler la ville affam�e. 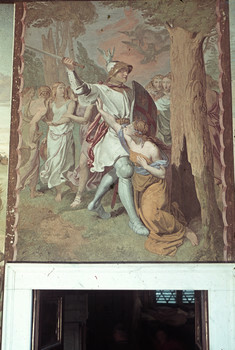 Cette toile est un carton de tapisserie pour la tenture de l'Histoire de Henri IV, command�e par le comte d'Angiviller. Elle t�moigne de l'int�r�t alors grandissant pour le pass� national. 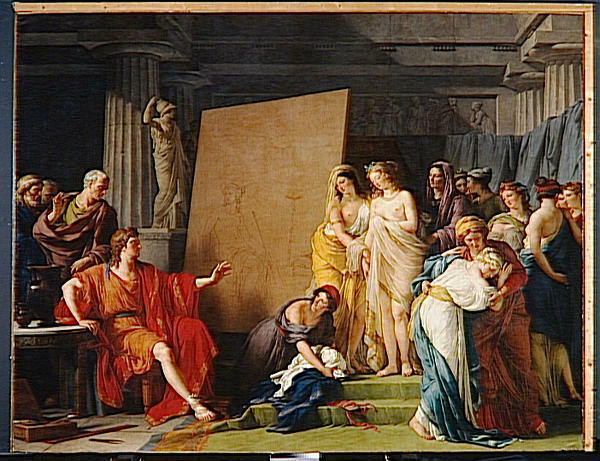 — Zeuxis choisissant pour modèles les plus belles filles de Crotone (1789, 323x415cm; 489x642pix, 57kb) _ The account of Zeuxis choosing his models is taken from Cicero, De Inventione, II, I, I, with a shorter description in Pliny the Elder, Natural History, XXXV, 36. Having been commissioned to paint a portrait of Helen of Troy for the Temple of Jupiter at Crotona, the famous Greek artist Zeuxis had to seek the most perfect characteristics from five of the greatest beauties of the city. Vincent has exhibited his own scholarship by incorporating items which are exclusively fifth century, while the image of Helen herself is drawn in outline as on a Greek vase painting. 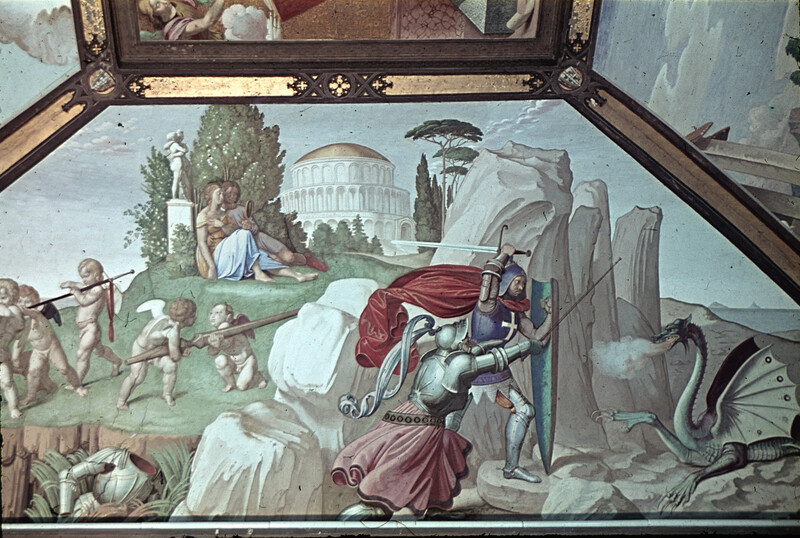 The Doric columns, the mixing bowl with its colonnettes and oil flask placed on the table beside the artist, the frieze derived from the sarcophagus of the Muses in the Albani collection in Rome, and Zeuxis's arm which seems to have been borrowed from the Apollo Belvedere, are all talismans of classical erudition and archaeological truth. Here Vincent seems to revive the seventeenth century idealistic vision of achieving perfection by selecting the most pleasing aspects from the natural world, but it seems that Vincent may be suggesting that at least one of the young beauties was rejected altogether. Why else would the girl in the foreground by weeping in the arms of another if she had been chosen to model? Thus, while otherwise following the narrative, the artist has distorted the story by introducing the human reality of sorrow and disappointment, albeit superficial, into a scene which would otherwise be without deep sentiment. Vincent's large painting, one of his most ambitious efforts, was enthusiastically received by the critics. 1992 Manuel Blasco Alarcón [1899–], Spanish painter writer, cousin of Pablo Picasso. ^ 1888 (09 Aug?) J�rgen Roed, Danish painter born on 13 January 1808. He studied at the Kongelige Danske Kunstakademi (at that time the Kongelige Danske Akademi for de Skj�nne Kunster), Copenhagen, from 1822 to 1833, from 1828 under C. W. Eckersberg. His early portraits provide evidence of the purity of line and clear and subtle coloring that characterize his work. Like many contemporary artists he depicted well-known buildings in Denmark, encouraged by the art historian N. L. H�yen, who was eager to see Danish art assume a distinctively national character. His series of exteriors of Frederiksborg Castle and the cathedrals of Roskilde and Ribe date from the mid-1830s. Interior of Ribe Cathedral (1836) is an important work painted in the manner of a 17th-century Dutch church interior. It is remarkable for the light and subtle tints and reflections. Although it appears to be a meticulous and realistic rendering of the building, the painting may be an antiquarian�s projection of the interior of the cathedral restored to its former medieval glory. With Scene of Departure at the Custom-house (1834) he engaged in genre painting. A young man takes leave of his parents before embarking on a voyage. His sweetheart turns her back to conceal her tears, while others busy themselves in the moments before the ship�s departure. The painting is in the Biedermeier style, but, far from being sentimental, the scene is endowed with a strangely melancholy atmosphere, due in part to the fog and steam. � Roed's students included Viggo Johansen, Frederik Vermehren, Kristian Zahrtmann. — En kunstner p� vandring (1832; 690x492pix, 125kb) self-portrait? — The Garden of the Collins Townhouse (697x525pix, 62kb) under light snow, more the house than the garden. ^ 1930 Rowland Bragg Wilson, US illustrator, cartoonist, and movie animation artist, who died on 28 June 2005. Author and illustrator of the brief guides for painters of backgrounds (PDF downloads): Layout Composition, Illusion of Space, Painting Light. Some of Wilson's best work appeared in a popular advertising campaign for New England Life Insurance, which he produced while living in Weston, Connecticut. Distinctive for their representations of impending disaster, the situations in Wilson's cartoons were like clownish screams of warning in a silent film. In one, a wrecking ball at a Manhattan construction site swings toward a glass-walled corner office, where a smug executive reclines in his chair, his back to the wall, as he discusses his insurance coverage on the phone. In the early 1970's, Wilson moved to London, where he worked in animation. After returning to the United States, he was an animator on the Disney films The Little Mermaid, The Hunchback of Notre Dame, Tarzan and Hercules. He was awarded a daytime Emmy for his animation on Schoolhouse Rock! His cartoon collection, The Whites of Their Eyes was published in 1962. ^ >1846 Karl Wilhelm Anton Seiler, German painter who died on 21 February 1921. �- The Discussion (1919, 24x32cm; 1058x1398pix, 154kb) this is the version in which the pseudonymous Trukle Wontoak Bugoff Saylor has substituted pictures on the wall with works of Seiler and a few others..
^ 1824 Alexander Hugo Bakker-Korff, Dutch painter and draftsman who died on 28 (31?) January 1882 (his birth date is given as 31 [sic] Sep 1824 by the same source which lists his death date as 31 Jan 1882). He was first trained under Cornelis Kruseman at the Academie in The Hague (1841�1845), then specialized in history painting at the Antwerp Academie under Gustaf Wappers from 1845 to 1848. He set up as a painter in The Hague in 1848 and exhibited large history paintings in 1848 and 1849. 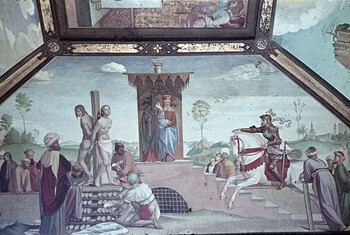 An example of a history painting from this period is Death bed of Frederick Henry. By 1852 he was living in Leiden but the following year, because of failing eyesight, he temporarily gave up painting until 1858 or 1859, when he started painting small-scale, realistic genre scenes based on photographs (e.g. The Pastry Cook). 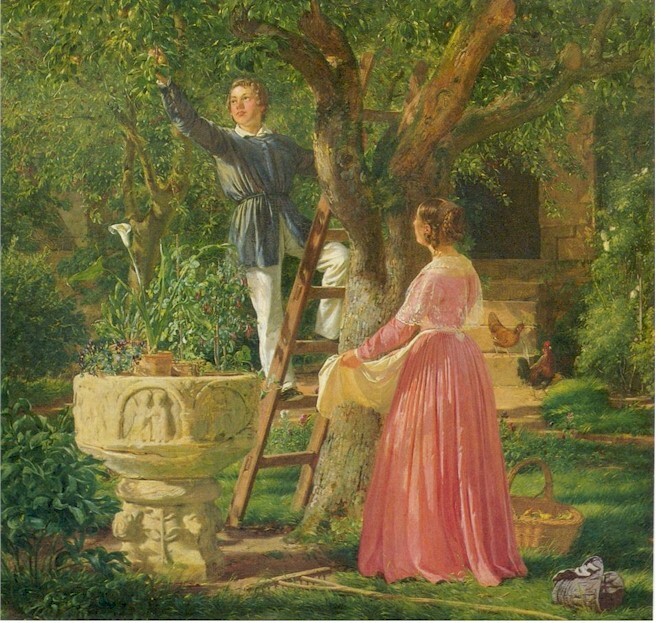 From 1861 until his death he regularly exhibited genre paintings. Most of these are small and generally depict one or more women (never men) engaged in conversation or domestic occupations. He was awarded the knighthood of Leopold when The Romance was shown in Brussels in 1869. Though highly respected, he lived a solitary life and had no direct students. Bakker-Korff�s career can be divided into three phases: large-scale history paintings (1845�1852); small, realistic scenes of working-class people, painted from photographs (1859�1860); and small, slightly ironical scenes of women in meticulously detailed interiors (1861�1882), for example Under the Palms (1880). The very high standard of craftsmanship in his paintings after 1861, compared to his rather awkward, early history paintings, testifies to the influence of photography. He made numerous drawings of two types: casual crayon drawings that served as preparatory sketches for his paintings, and pen-and-ink drawings, sometimes touched up with watercolor, as records of his finished paintings intended for sale. — Hutspot (32x49cm; 630x973pix, 103kb) one carrot, two onions, three potatoes, and a pitcher lying on its side. ^ 1815 Jean-Marie Reignier, French painter who died in 1886. He was a professor of drawing and flower painting at the École des Beaux-Arts in Lyon, where he had among his students Pierre-Nicolas Euler [1846-1913], Eugène Baudin [1843-1907], Adolphe Castex-Degrange (who succeeded him in 1884). — Telemachus and Eucharis (1824,.295x252cm; 960x815pix, 393kb _ ZOOM to 2196x1864pix, 2425kb) _ Telemachus and Eucharis were lovers forced to part. The story is from Greek mythology, as retold by F�nelon [06 Aug 1651 – 07 Jan 1715] in Les aventures de T�l�maque (1699). Telemachus had set out to find his father, Odysseus (Ulysses), the famous hero of the Trojan War. The goddess Athena accompanied him disguised as his guardian, Mentor. They were shipwrecked on the island of the nymph Calypso, and Telemachus fell in love with Eucharis, one of Calypso's attendants. But Mentor intervened to part them, so the search for Odysseus could continue. "Mentor le prit par la main et l'entra�nait vers le rivage." wrote F�nelon. "Télémaque suivait à peine, regardant toujours derrière lui." 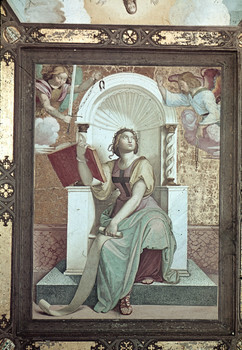 Neoclassical history paintings such as this were meant to be lessons in virtue, and duty invariably triumphs over love. 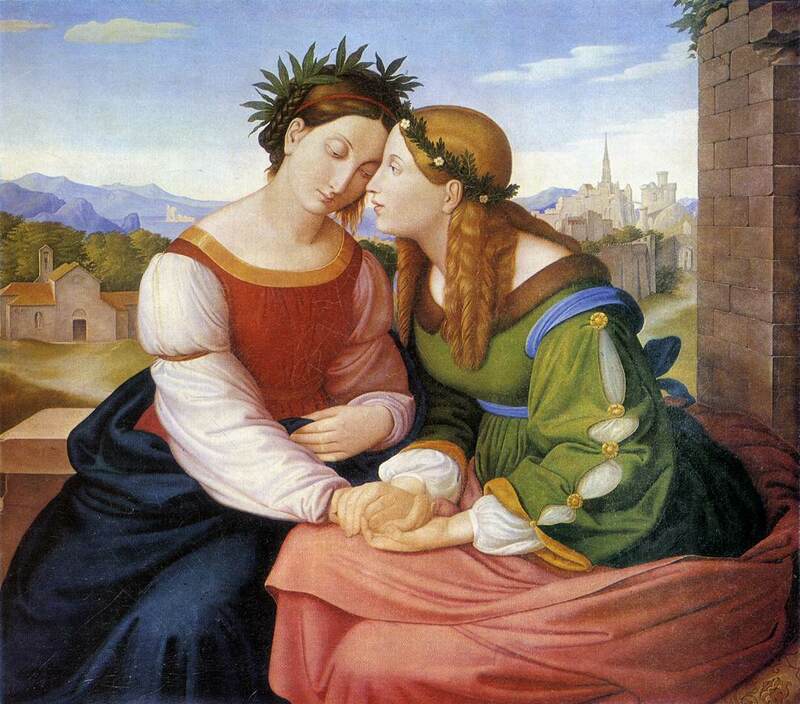 ^ 1789 Johann Friedrich Overbeck, German Pre-Raphaelite painter who died on 12 November 1869. Overbeck came from a well-situated family. His father was a senator and later a mayor. First, he attended painting lessons in his hometown of L�beck, where he was taught by J. Peroux. Overbeck enrolled in the Vienna Academy of art in 1806, but was subsequently expelled after declaring his opposition to Classicism. He left the academy for Rome. There he formed the German Romantic school of the Nazarenes, who painted religious scenes in a medieval and high-Renaissance style. The Nazarenes consisted of Peter von Cornelius, Veit, Schadow-Godenhaus and other German Romantics. 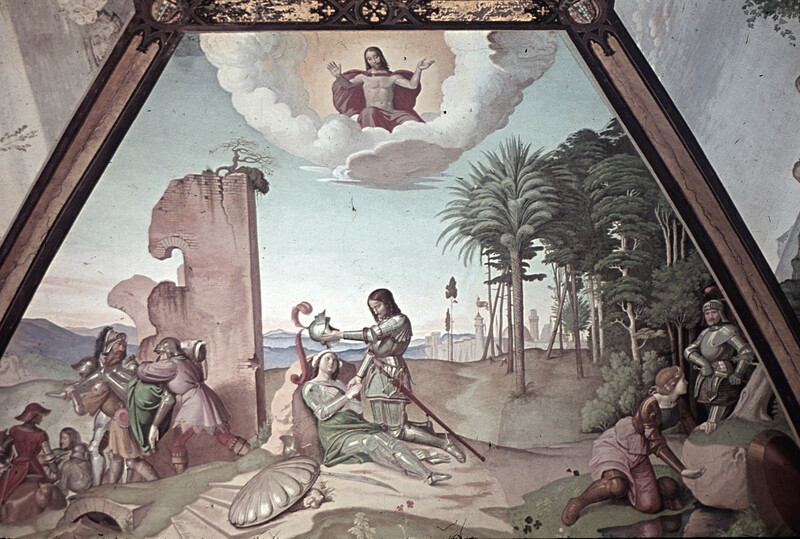 In 1813 he converted to Catholicism and he tried to paint a new image of Christ, one that people would revere. — He studied under Eberhard W�chter. In Rome, in 1809, together with Vogel, Hottinger, and Pforr [05 Apr 1788 – 16 Jun 1812], he founded the Lukasbrüder (aka Nazarene). The group had very strict views on the religious mission of art and aimed at renewing German religious art by imitating works of artists such as Dürer, Perugino, and the young Raphael. The Nazarenes' ideas are considered the primary example of the German Romantic movement. — Overbeck was the leading member of the Nazarenes. He moved to Rome in 1810 and was based there for the rest of his life, although he made several visits to Germany. In 1813 he was converted to Catholicism and apart from a few portraits (including a self-portrait) his work was almost exclusively on religious themes. He painted in a consciously archaic style, clear and sincere but rather pallid, based on the work of Perugino and the young Raphael. 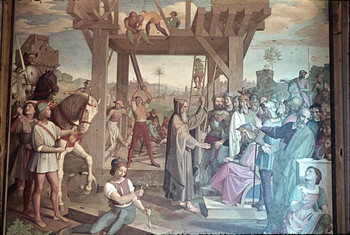 The Rose Miracle of Saint Francis (1829) is his best-known painting. The high-minded and didactic tone of his work won it a more sympathetic acceptance (particularly in England) than its artistic quality alone merited. William Dyce and Ford Madox Brown were among his supporters and there were affinities between his aspirations and those of the Pre-Raphaelite Brotherhood. 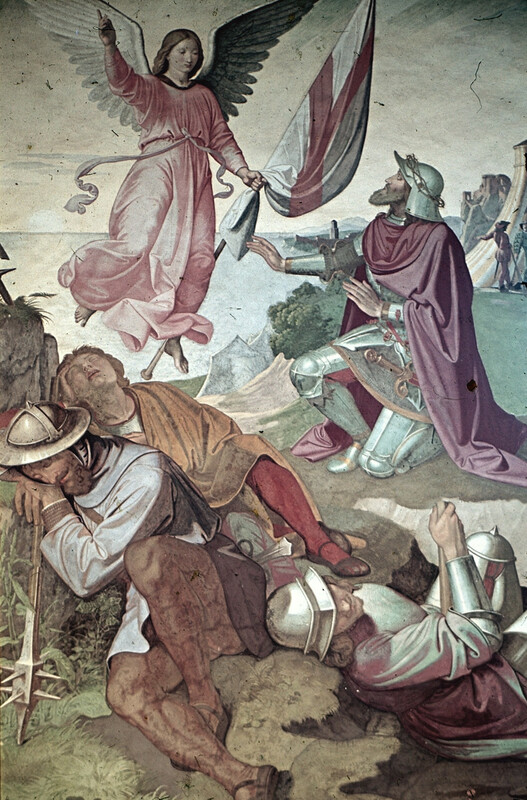 — The Nazarenes were a group of young, idealistic German painters of the early 19th century who believed that art should serve a religious or moral purpose and desired to return to the spirit of the Middle Ages. 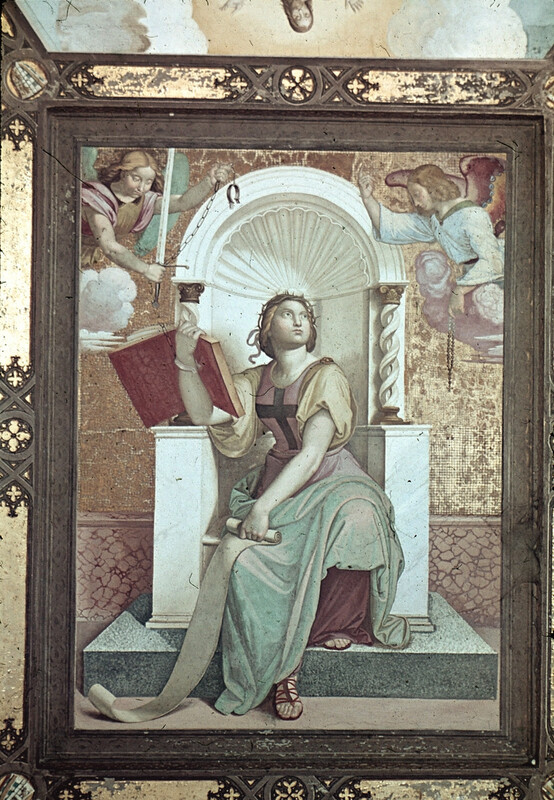 The nucleus of the group was established in 1809 when six students at the Vienna Academy formed an association called the Brotherhood of Saint Luke (Lukasbr�der), named after the patron saint of painting. The name Nazarenes was given to them derisively because of their affectation of biblical dress and hairstyles. 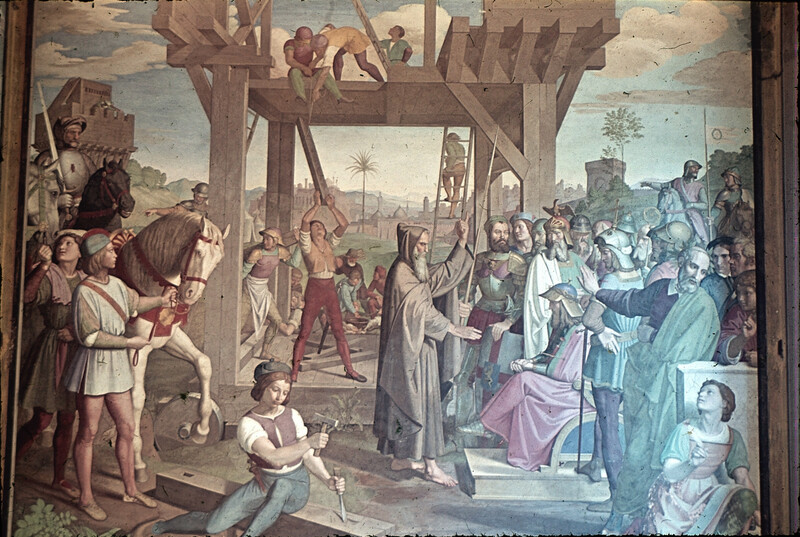 They wished to revive the working environment as well as the spiritual sincerity of the Middle Ages, and lived and worked together in a quasi-monastic fashion. In 1810 0verbeck. Pforr, and two other members moved to Rome, where they occupied the disused monastery of Saint Isidore. Here they were joined by Peter von Cornelius and others. 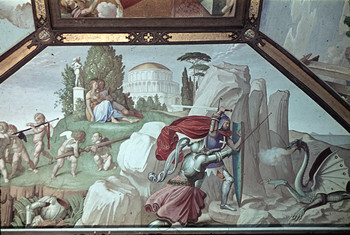 One of their aims was the revival of monumental fresco and they obtained two important commissions which made their work internationally known (Casa Bartholdy, 1816-1817; and Casino Massimo, Rome, 1817-1829). Stylistically they were much indebted to Perugino, and their work is clear and prettily colored, but often insipid. In general, modern taste has been more sympathetic towards the Nazarenes' simple and sensitive landscape and portrait drawings than to their ambitious and didactic figure paintings. The Nazarenes broke up as a group in the 1820s, but their ideas continued to be influential. Cornelius had moved in 1819 to Munich, where he surrounded himself with a large number of students and assistants who in turn carried his style to other German centres. The studio of Overbeck (the only one to remain permanently in Rome) was a meeting-place for artists from many countries; Ingres admired him and Ford Madox Brown visited him. William Dyce introduced some of the Nazarene ideals into English art and there is a kinship of spirit with the Pre-Raphaelites. — The Painter Franz Pforr (1810, 62x47cm; 1338x1001pix, 170kb) _ The Nazarenes painted quasi-devotional portraits of each other and their ideal wives or longed-for lovers. This is an example. 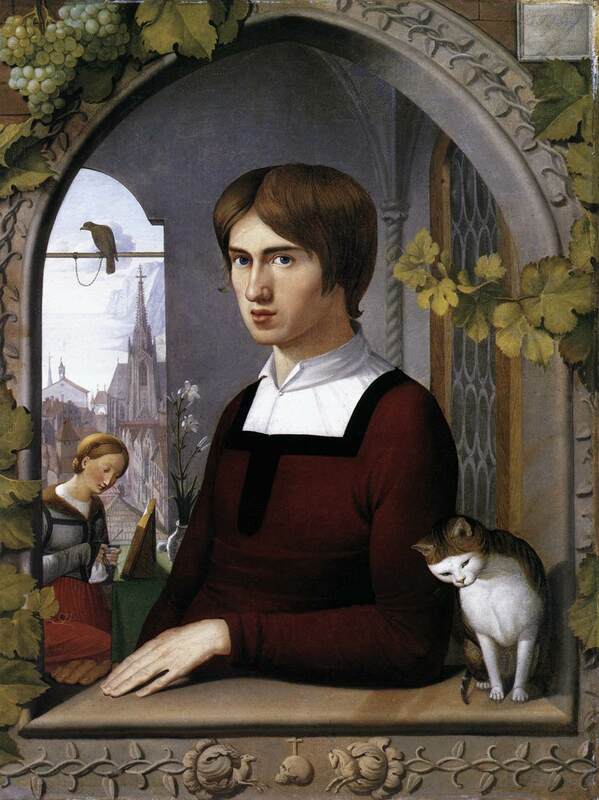 It was under Franz Pforr's influence that Overbeck turned to old German masters, such as Holbein, Cranach, and D�rer. 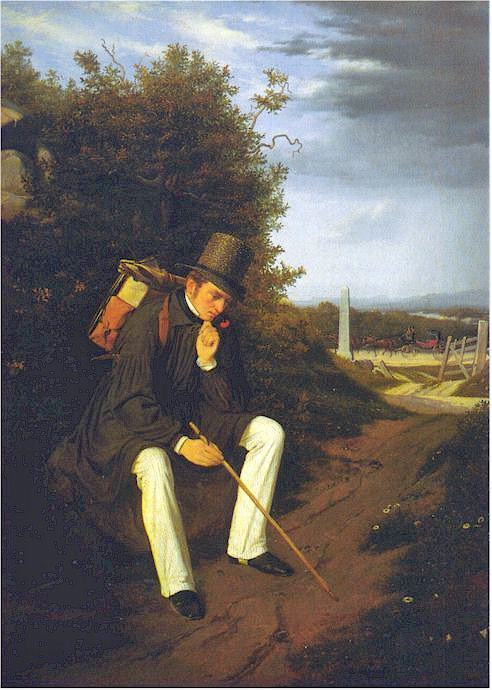 In this painting he created a monument to his friend. From an arched Gothic window Pforr is challenging the viewer with a penetrating but pious eye, as if asking: "Why have you not found the peace of piety?" His wife is deep in reverence, as if blessed by the lily, and the church tower provides an appropriate background. Pforr's sign, the cross over the skull, the vine tendrils, the watchful cat or falcon of hope, are all symbolically included. — Italia und Germania (94x104cm; 1003x1128pix, 119kb) and its copy made by Overbeck (much better as a computer image) Italia und Germania (95x105cm; 950x1079pix, 161kb) _ This painting was inspired by the novel and painting Shulamit und Maria (1811, 34x32cm; 1088x1011pix, 147kb) by Franz Pforr. 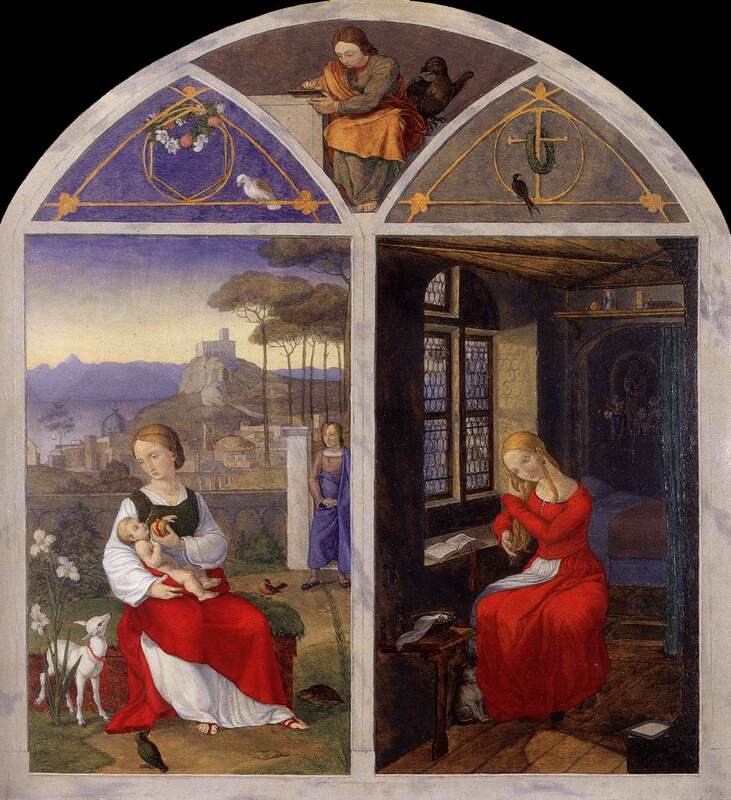 In his painting Pforr separates the Italian and the German worlds, the Old and the New Testament, while Overbeck eliminates the division and creates a sisterly unity. Rightly the title was changed five years later to Italia and Germania, for the clothes, the laurel and myrtle wreaths and of course the different landscapes and houses make it very evident what is meant. 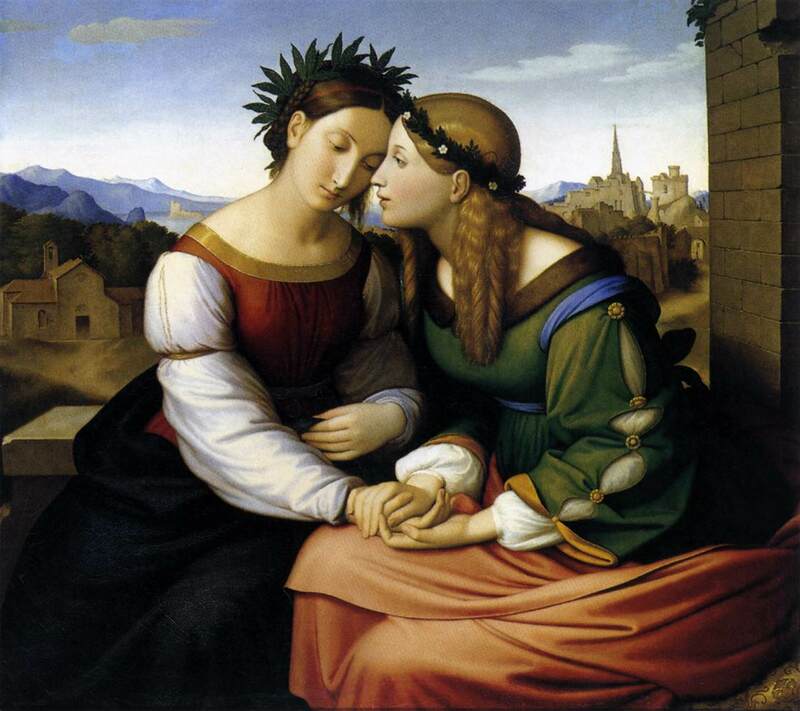 The physiognomy and the character of the two women is Overbeck's interpretation of Italian and German girls. The girls are shown as imaginary brides, wonderfully idealized and so delicately perceived that they have hardly an equal in Nazarene art. 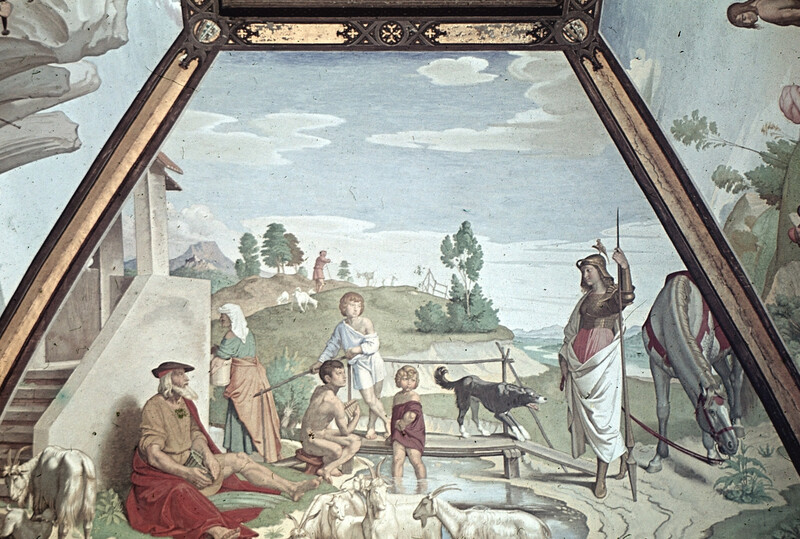 Overbeck has set a monument to the encounter of German artists with Italy that could hardly be more ardent or worthy of its subject. 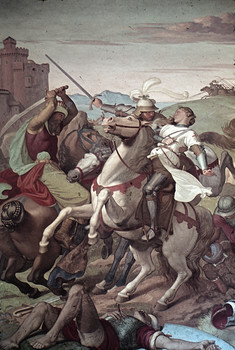 — 2 unlabeled images: (1) Italia and Germania (22x25cm); (2)(detail of The Liberation of Jerusalem)? — 55 images at Bildindex ; 41 of them are of B&W prints.